For the last few weeks Class 1 have been taking part in a Forest Schoolevery Friday afternoon run by a parent from the school Mr Crossman. 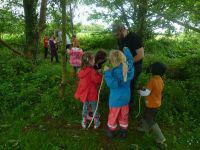 The children have investigated and learnt aboutthe types of trees that grow on the school grounds. They have had the opportunity to make a ropestory of the school field using all natural objects they found, took bark &leaf rubbings, made nests for imaginary creatures and also log people. 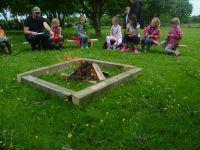 If the weather is kind to them the childrenare able to sit around the log fire for a story. A big thank you goes to Mr Crossman forspending time with the children on a Friday afternoon they are having afantastic time and always look forward to the next session.